I received an invitation to review the Forte Notation Software a few weeks ago. My initial reaction was to decline. I play the piano by ear. I cannot sight-read music nor can I write one. I can get the notes of my guitar licks, but finding the notes will not be fast. If I can write the music in my head using Forte then it must be good. I agreed to do the review after watching a short demo. 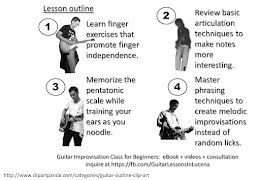 I was busy writing my Guitar Improvisation eBook these past few weeks and it was only yesterday that I had the time to check it. I want my first piece to be a simple boogie tune, with bass guitar, drums, piano, and electric guitar. I also do not want to read the user’s manual. My only guide was the memory of the video demo that I watched almost a month ago. I did not bother watching it again. I opened Forte Notation Software and selected Score Wizard. I clicked Pop/Rock/Jazz and selected my instruments. I was presented with a blank staff. I started with the bass in the key of C. I played the bass line on my acoustic, determined the notes, and started clicking on Forte’s staff to add the notes. As a guide, I drew a staff on a piece of paper and labelled EGBDF on the lines and FACE on the blanks. That is what I remember from my elementary music class almost forty years ago. Forte plays the corresponding note each time you add a note in the staff. Yes, unlike writing on a paper sheet, you can play back your piece to validate if what you wrote is correct. It looked quite easy until I played it back. It was out of tune. What? I initially thought I just misplaced the notes since the staves are too small for my eyes. While I was looking for a way to zoom the staff my son suggested holding control +. I replied that it is not Photoshop, but proceeded to try the shortcut anyway. It worked! The notes to the bass line were very simple so I tried again, but after several frustrating minutes, the melody was still out of tune! I cannot believe it! Forte is out of tune! I opened a few sample files and listened carefully. The tunes are correct! So what am I doing wrong? This was supposed to be easy! After several minutes of re-entering the notes on Forte I realized my mistake. The guide I wrote was for the treble clef, but the bass staves were expecting notes for the bass clef. Of course! A quick search shows that the lines of a bass clef are for the notes GBDFA while the spaces are for the notes ACEG. I was placing the notes incorrectly on the bass staff! I downloaded and printed a guide of the correct note positions, then re-entered the notes. The notes are now in tune! The rhythm guitar and initial piano parts were easy, thanks to the printed guide. I then tried the command to copy several measures with all instruments so I do not have to re-enter the rhythm and bass parts, but somehow the guitar notes were being shifted to a higher octave. I tried copying one instrument at a time and it worked. I did not bother finding out what I did wrong when I tried copying all instruments at once. I tried to enter the drum parts next, but I have no idea how to indicate the drums. Forced to read the Program Help, I learned that each note has a corresponding percussion sound assigned to it. I tried adding a note and it sounded like a kick drum. However, it plays a different instrument when I play it back. Not wanting to read Program Help at the time, I deleted the drum track because I was already hungry. I got back to Forte after dinner and added some piano improvisations. By this time, I was already comfortable with Forte that I sometimes just listen to the note as I click it on the staff instead of finding the note on my guitar. I also had to enter sharp notes for my improvised parts, which is done by selecting # on the input palette. However, I do not know how to change an existing note to a sharp note. I figured it would be faster to delete the old note and re-enter the correct note than to read the manual so that is what I did. I played my masterpiece and I was very satisfied, considering that I never imagined being able to write a musical piece prior to using Forte Notation Software. Imagine what can be done in the hands of a real composer and arranger! My verdict? 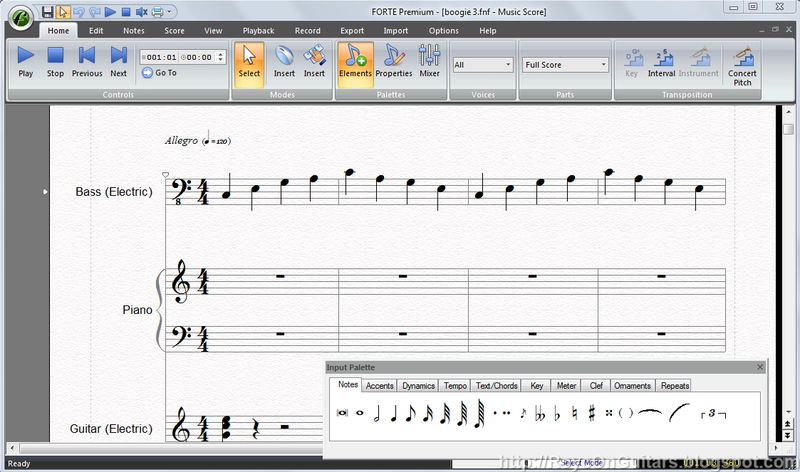 Forte Notation Software is quite easy to learn and use. I only tried a few features, but it is enough to convince me that the rest will be as easy.